There was a special force of the Samurai, a pinnacle of Bushido back in the day: the katana-wielding Kensei. While we were tippling idly, they were studying the sword. Kiyokawa blender (which means ‘pure river’ in Japanese) took that determination and striving for perfection and created a sumptuous blend they named Kensei. The artisanal and painstaking technique of blending that originated in Hokkaido takes top-notch Whiskies and blends them in the shadow of the Tanzawa mountain. The Spirit spends up to four years in American oak barrels before it’s bottled in honor of the ancient warriors. The soft and velvet textures that complement floral and fruity notes in this amber-gold Spirit are a welcome answer to the astronomical demand for Japanese Whiskies. While aged expressions fly of the shelves and we wait for the classics to reach maturity, this excellent no-age-statement and its innovative character will keep us satisfied. You may make a slick Highball with it, but we recommend you sip on it on the rocks first. 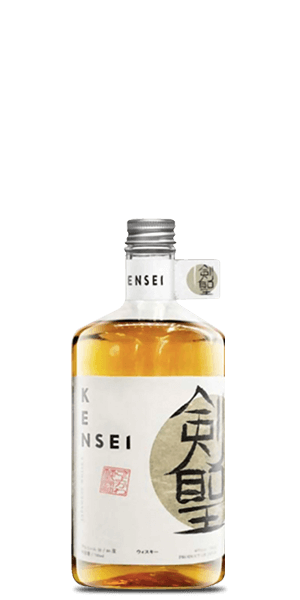 What does Kensei Blended Japanese Whisky taste like? The Flavor Spiral™ shows the most common flavors that you'll taste in Kensei Blended Japanese Whisky and gives you a chance to have a taste of it before actually tasting it. Fresh and fruity on the nose with pleasant woody notes and hints of dried fruits, honey and cut flowers. Smooth and delicate palate, balancing sweetness and toasted spices. Lingering, floral and fruity finish.